On Monday Feb 6th, 2017, I was hosted by a number of local partner organizations in Thunder Bay, Ontario, to facilitate civic dialogues on the topic of the racial divide in the city. I was arriving from Berlin where I had just spent a few days with a group of UN negotiators and then with a group of classroom teachers, helping them learn practical ways to make space for heated conversations in their spheres of influence. Even though I am competent with heated conversations, having facilitated many in the past decade, I still get a trembling in my chest as the hour approaches. And I felt the trembling as I arrived in Thunder Bay, wondering if my first generation Canadian/settler self could make a positive difference in this community – or, would I make things worse by opening cans of worms better left untouched? As it happened, these conversations took place days after two local Indigenous women had been victims of a hate crime in which a white man threw a trailer hitch at them from a moving vehicle, seriously injuring one of the women. Sadly, as we learned in the dialogues, this was not a totally unique incident. Some of the most important moments within the dialogues were those in which participants spoke directly to this and similar acts of violence, expressing virtually unanimous regret and outrage, as well as frustration with local leadership (the mayor, the chief of police) for not taking a stronger stance. While demanding that authorities do more is absolutely justified, as a conflict specialist I am aware that when violence reaches this level and is felt in the social fabric of a community, it cannot be easily quashed by authorities. Thunder Bay, like many communities in Canada and around the world, needs to grapple with polarization at the cultural level, at a person-to-person level, in order for violence to be prevented. Through creating dialogue in which people hear each other, even if they don’t like what they are hearing, even if they get a little bit hurt or disturbed by what is being said, we attempt to avoid the more serious forms of harm. A number of moments and dynamics stand out for me from the two dialogues, which I summarize below, keeping in mind that mine is only one perspective on what happened during the events. I hunger for the views of others, and wonder what others saw from their vantage point as we make sense of these conversations together. I first want to say something about the method of facilitation I used for these events, its premises and its limits. I rely on something calls the Lewis Method of Deep Democracy, which begins with the premise that we need to make carefully constructed spaces where people (ordinary people, not just experts) can say what they think and hear from others who disagree with them or have different experiences. This orientation assumes that conflict develops further and divisions grow bigger, the more each side keeps to its own, and that it is better to have ways of engaging the heart of the conflict rather than skidding around it. To make conflict approachable, and prevent it from becoming a totally chaotic shouting match, Deep Democracy introduces structured ways of speaking. One structured process (called the Soft Shoe Shuffle) involves people making statements standing in a large space, and moving towards and away from others’ statements indicating their degree of agreement or disagreement, respectively. When a polarity emerges another structure process (called the Argument) is introduced in which each side is given time to make statements while the other side listens. Each person is welcome to join different sides, to hold multiple views and feelings, even ones that are seemingly contradictory to each other. The point of exploring views and emotions surrounding a conflict, is to get insight, to learn something new that we didn’t know before about ourselves in relation to others. The learnings are understood to be necessary to either resolve the conflict or to help every person navigate the difficulties of living with difference with more awareness. While the Deep Democracy process has concrete steps for turning those insights into decisions and actionable items, the civic dialogue form is not always action-focused. 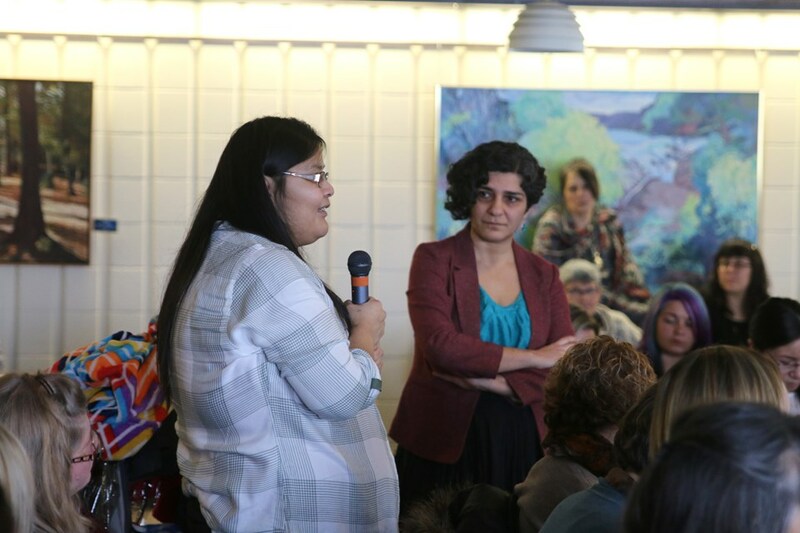 As such, it is only effective as one in a chain of initiatives, or nested within existing and ongoing initiatives (as is the case in Thunder Bay), to address social issues. One thing about this format of conversation is that it does not lend itself to long and complicated analysis. I often ask people to avoid the essay form as they speak! The conversation generated is non-linear, and while it goes deep (i.e. unveils bits of experience or emotion that might go unmentioned otherwise) it doesn’t follow what we might typically think of as a logical flow. I could observe some frustration with this unusual form of communicating in the dialogues in Thunder Bay. I think every method of communication has trade-offs, no single method will be preferred by everyone – for me it is more important to communicate (and find various methods for it) than to wait to find the perfect method of communication that makes everyone happy. The other thing about this format is that it is pretty important to keep the structure of the conversation to prevent degenerating into total chaos, and it is the role of the facilitator to safeguard the structure. In the Thunder Bay dialogues, I had to intervene a few times in my role to safeguard the structure – which meant cutting off an outburst of anger in response to a statement here or there (“Right now this person has a turn to talk and your job is to listen.”) and pressing participants to stick to the suggested process of talking across the divide (instead of speaking to one’s own side, for example). I know that I upset a few people with these kinds of interventions. I feel they were necessary but perhaps could have been done more skillfully. Like the rest of us, my communication is a work in progress. Often a critique of such public dialogues is that they draw “the usual suspects”, i.e. those people already engaged in these conversations, those who want to bridge the divide, not the ones throwing trailer hitches out of cars. I think this is largely true, and I always wish we could do more to reach beyond the choir. At the same time, there is a lot of important conversations to be had within the choir: between, say, Indigenous and racialized people, and the white allies who are championing the causes of racial equality, reconciliation, decolonization etc. As anyone who has worked on these issues within an NGO or committee or activist group well knows, there is no shortage of conflict inside these groups, and in fact the dynamics inside the group often reflect the dynamics in the larger society which they are trying to impact. From this perspective, those who come to a civic dialogue are the right people. If they become more thoughtful and more effective in their efforts as a result of the conversation, the conversation will have been worthwhile. I have found this to be a common sentiment expressed in conversations on diversity throughout Canada and the US (and not only by Indigenous folks), and I have also found that there is usually shock and strong response in the opposite direction (not only by white folks), which goes something like this (and I paraphrase): “But what about our shared humanity and the fact that everyone’s blood is red? I don’t feel separate from you, I respect you and love your culture – and I feel that denying our oneness and harping on our differences is going to make our divisions worse, not better. Why don’t you join me, or let me come join you, and we can be one again?” This, as you can imagine, typically aggravates the first side further more, and a cycle of conflict becomes quickly visible. We took some time, particularly in the evening session, to give more colour and texture to both sides of this Argument, this philosophical and strategic difference that marks so many well-intentioned communities of people wanting to end racism and other forms of oppression. While the Thunder Bay argument had its own unique flavour and examples, it was not so different from other arguments across this axis of difference that I have been part of. There is something archetypal about the argument: on the one hand we depend on the recognition of our unique identity, on the other hand we crave the sense of belonging together in a common identity. When put this way it is not hard to see that both sides of the argument are “right”, that they are in fact two sides of the same coin, that they depend on each other. At the same time the strategic orientations informed by the two sides look diametrically opposite: one searches for justice by emphasizing what is wrong in the relationship with “the other”, the second looks for harmony by emphasizing what is shared and can flourish in the relationship. In some ways this is a very painful argument to have, particularly, perhaps for the side that believes we’re all one, which experiences it as despairing because this argument directly challenges the ideal, or the myth of the harmonious, diverse, multicultural society that so many of us hold dear. At the end of the argument, some people find more sympathy for the other side, while others become more convinced of their own position, which is fine from my perspective as a facilitator (since both sides are actually, in their own way, right). The personal insight that keeps occurring to me, which was refined for me in Thunder Bay is this: there is a time for each side of the coin, a time for justice and a time for harmony. This time, this particular moment in the history of Canada, is a time for justice. It is a time when the dark parts of our country’s history have finally become visible, and until there is a sense that justice has been restored, that the wrongs of the past have been addressed, we have little ground for harmony. This, of course, does not mean that there isn’t room for love, for connecting with each other and getting in touch with our oneness in smaller, perhaps more private moments. But it does mean that those of us wanting to make things better have to watch our language, we have to think twice about the political and personal impact of our words every time “we are all one” is about to leave our lips in public. Oneness is not a given, not at this moment, because it is the opposite of the experience of those who have suffered from oppression. It is an ideal that has to be arrived at. Oneness has to be won. At the end of a Deep Democracy civic dialogue session we instruct participants to ask themselves: of all the things that have been said, what is it that hit home? What was said that stood out, that surprised me, or punched me in the gut, or had some other kind of emotional or visceral impact on me? And if I look at that thing that hit home for me, what is it trying to teach me? – The stories of Indigenous folks, in particular of one young woman who described how she felt when she realized that she and the other handful of Indigenous girls in her elementary school class were the only ones not invited to a classmate’s birthday party. That story hit me hard for its pain, and for the pain in generated in me when I realized that I could have been the young birthday girl, oblivious to my implicit bias, innocently picking who I invited to my party based on who I felt drawn to. There is no point being disappointed in my younger naive self, but as a parent now, I seriously wonder, what can I deliberately do to make sure my children don’t discriminate based on skin colour next time they send out birthday party invitations? – The voluntary vulnerability of white folks, in particular a middle age woman who stood up and admitted that racism is in her blood, in her DNA, in her way of seeing – and that she struggles with it on a daily basis. There were many other white folks who spoke eloquently to the injustices in colonial history, to white supremacy and the responsibility to reverse it. It was powerful to hear these words, particularly spoken by white men – but the ineloquent admission to one’s internal struggle with racism touched me in a deep way. I found it healing to hear it spoken. – The contributions of the non-Indigenous people of colour in the room, my fellow racialized folks. I was first moved when racialized people stood with white folks and listened to the Indigenous stories, and when one person went further by inviting Indigenous folks not to let us off the hook, to address us too as settlers on their land. I was enormously impacted by a tall woman who identified herself as an immigrant from Nigeria, and proceeded to describe her shock that Indigenous people in Canada are treated far more poorly by colonizers than black people in Africa. I loved the young Muslim woman who spoke about the need to connect more fully with her own heritage and identity to be able to better participate in conversations on decolonization and reconciliation. I was almost at tears when at the end of the evening dialogue two young men from India came up to thank me for the session, telling me how eye-opening and how satisfying it was for them to have witnessed the conversation from the chairs (neither of them had taken part actively in the dialogue). “I have no transport so I took a $25 taxi to come here tonight – and I am so glad I came”, one of them told me. As an immigrant and a person of colour I am so aware of the struggles “my people” face. The fact that “my people” took the trouble to come to these dialogues, not to complain about their own suffering, but to think through what it is to be a settlers here, felt so great to me. Maybe there is hope for Canada after all, I thought to myself on the plane ride back home to Vancouver. – The moment at the end of the evening dialogue when one white woman stood up and said (I paraphrase): “Thank you for the invitation to come to Aboriginal Day. I never knew it was my party.” She was addressing an Indigenous participant who had spoken earlier about her efforts organizing Aboriginal Day and lamenting that allies don’t usually show up to that day’s activities. As the two women now literally crossed the floor and embraced each other, I thought to myself this is why we host these dialogues. The realization being described is so simple: I as a white person am invited to Aboriginal Day activities. It seems like something that should have been obvious – but of course it is not obvious because the divide is real and people are so seldom communicating across it. The two sides don’t even know that they need to correct a misunderstanding about what and who Aboriginal Day is for, because they don’t know they have a misunderstanding! Meanwhile the impression of the size and seriousness of the divide has inevitably deepened (I imagine the organizer of Aboriginal Day privately thinking: “those white people never show up – they don’t care about us”). And yet it only takes a meandering conversation, a speaking from the heart on no specific topic in particular, to accidentally correct a misunderstanding we never knew we had. This is the gift of having dialogues, of coming into relationship, even if it is under contrived circumstances for three hours on a Monday night. As I think about the impacts of the dialogues, I am also aware that some participants were negatively impacted, in the sense that they felt triggered, hurt or insulted by something they heard, a judgement they felt coming towards them, or by a feeling that they were not quite heard by others. Of course, as an organizer and host, I feel responsible for the hurt feelings and a small part of me wonders if it is fair to invite people to conversations where they do get hurt. But mostly I feel this: becoming vulnerable and prone to suffering is the price that we pay for attempting to communicate with others who are different from us. Every time we open ourselves to others we risk being hurt. And unless we are willing to take this risk there is no possibility for relationship. Unless we are willing to have our feelings hurt, there is no possibility of bridging the divide. This is not to say that we shouldn’t attempt to make the space of conversation as safe as possible, or that we can’t do more to take care of people who do get hurt, or that there shouldn’t be more of an explicit trigger-warning on these kinds of conversations (perhaps I am naive to think that it goes without saying that we might get triggered!) But I would like to encourage us not to overstate this harm, and to consider continuing these conversations despite the fact that they leave us feeling raw. The conversations are not 100% safe – they can’t be because the stakes are too high, the conflict has gone on for too long, too many people are literally in danger out in our communities. These conversations are like small controlled fires that we light so that we can prevent forest fires from burning everything down. If we are not willing to have our feelings hurt a little in the course of conversation, it is more likely that conflicts will escalate, that actual, physical harm with be done to us or to those we love. If we don’t have these talks and feel the pain and the rawness, we will continue to throw trailer hitches at each other. And so, I say, lets continue to talk. I was struck by how different this event was than everything else I have participated in. We moved around. We strode, or shuffled or edged or were drawn by persons, emotions, ideas or we were stuck on the floor by the contradictions we felt in our bones and muscles. I felt more fully engaged than when sitting and talking, and writing and making lists. It was a kind of a dance. Brilliant. I had no idea what to expect from the evening event other than I felt compelled to attend and needed to see and feel for myself physically what I had been reading about in our newspaper of our City’s crimes against our indigenous citizens. I feel so badly And what can be done on a personal level, that can improve the situation. I learned lots, but I don’t know what is the next step. This is an inspiring essay about the reality of having conversations across the deep divides that exists amongst us as people. It asks many of the questions that confront those of us who believe in harmony and diversity. Your clearly articulated reflections that can come only from rigorous critical thinking and sincere practice was deeply affirmative for me to read. Thank you! I’ve just learned of this afternoon/evening shared and wish I could have been a participant. After reading the comments and the facilitator’s reflections summing it up I feel I had missed out on an amazing and valuable experience…. Having had the opportunity to attend the Conversation and read the much appreciated Blog, I want to express my deep appreciation for the way the event was facilitated. What a painful and healing way to meet. Proud of you, Aftab and what you are doing ! Makes me feel humble and grateful. THANK YOU! Wauw Aftab, you did two great jobs. Facilitate this conversation and writing it down so clear. Thank you for sharing. And I will cherish the wisdom you gave me: ‘ Unless we are willing to have our feelings hurt, there is no possibility of bridging the divide.